Concrete walls/foundations, driveways and walks can greatly enhance a property’s value and appearance. Like any other significant purchase, buying concrete requires a basic understanding of the products being considered. Healthy, handsome, long-lasting concrete takes thorough planning, a quality mix, professional placement, and proper curing and maintenance. The time to think about what you want in appearance, performance and maintenance is before the concrete is placed. Concrete construction is best completed by professionals with an extensive understanding of concrete and significant experience working with it. Usually several parties are involved — the contractor/builder, the ready-mix producer, and the owner. The technical aspects such as planning, preparation, mix specification, placing and finishing are the responsibility of the builder, ready-mix producer and the concrete contractor. Concrete is a combination of portland cement, crushed stone, sand and water. Admixtures, which are ingredients added before or during the mixing of concrete, are also used. Admixtures are used to strengthen concrete, to speed up or slow down the set-up time, and to help protect concrete against the effects of temperature changes and exposure to chemicals such as deicers. Because concrete is a blend of natural materials, it may have some natural imperfections. The performance of exterior concrete slabs is greatly influenced by the introduction, or entrainment, of microscopic air bubbles into the concrete. Air entrainment helps protect concrete that will be exposed to freezing and thawing and deicers. 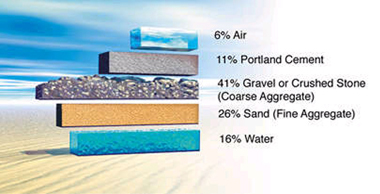 An air entrainment admixture causes microscopic air bubbles to form throughout the concrete. These tiny bubbles function as relief valves when water in the concrete freezes, helping to prevent surface deterioration. The typical air entrainment for exterior flatwork is in the five-to-seven percent range. Slump is the term used to describe the consistency, stiffness and workability of fresh concrete. The result of a slump test is stated in inches. It is influenced by the amount of water in fresh concrete. More water means higher slump, but water is not the only influence. Admixtures can be used to increase slump without increasing the water in the concrete. The type of aggregate, the air content, the admixtures, temperature and the proportions of all the ingredients affect slump. The typical slump used for external flatwork is four inches, plus or minus one inch. For a concrete foundation the preferred slump is five inches, plus or minus one inch. A pound per square inch (psi) is the unit of measurement used to describe the compressive strength of concrete. The most desirable strength for external concrete slabs varies based on climatic conditions. In broad terms, the colder the climate the higher the desired psi. Areas which experience many freeze-and-thaw cycles also require a higher psi concrete mix design. The typical concrete strength used for a driveway in Southeast Michigan or Northwest Ohio is 4,000 psi; in Southwest Florida it may be 3,000 psi. The concrete used on a highway bridge may have a compressive strength of 5,000 psi or more. When ordering ready mixed concrete, customers should advise the ready-mixed producer of the intended use for the concrete. Kuhlman Concrete can mix hundreds of different concrete formulations to meet the requirements of specific projects. Picking an experienced and qualified contractor is one of the most important steps in assuring a long service life for ready-mixed concrete. A good source of information on contractors is your local concrete producer. The producer will have had contact with dozens of contractors and will be glad to give you a list of the most qualified for a specific type of job. Be sure to ask prospective bidders for a reference list of both recently completed jobs and projects completed in recent years. When checking a contractor’s references, ask if the work was completed on schedule, within budget, was of good quality, and if the customer would use the contractor again. your property’s value and appearance!